It's 22:49 in Modena, Italy right now. Traffic A01 - KM 156,0 - Secchia itinere nord A view of the current traffic situation. 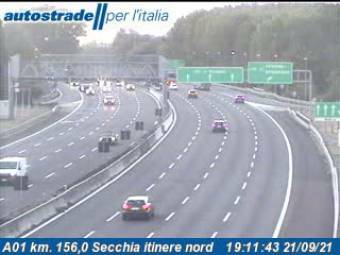 Modena: Traffic A01 - KM 157,0 - Modena Nord itinere sud, 0 miles away. Modena: Traffic A01 - KM 158,0 - Modena Nord itinere nord, 0 miles away. Modena: Traffic A01 - KM 162,0 - itinere sud, 0 miles away. Modena: Traffic A01 - KM 166,1 - itinere sud, 0 miles away. Modena: Traffic A01 - KM 172,0 - Modena Sud itinere nord, 0 miles away. San Donnino: Traffic A01 - KM 169,7 - Modena Sud itinere sud, 4.9 miles away. San Donnino: Traffic A01 - KM 170,8 - Modena Sud itinere sud, 4.9 miles away. Campogalliano: Traffic A01 - KM 153,0 - Calvetro itinere sud, 5.1 miles away.